Ian Milliss, Georgie Pollard and Alex Wisser are participating in this exhibition coming up soon at Artbank - hope to see you there! The Window Gallery of Atelier of Lyttleton Stores Cooperative presents an exhibition of KSCA projects Saturday the 6th of April, 6 to 6:45pm. Would you like to learn how to earn cash providing wild edible weeds for the restaurant and catering market in the city? 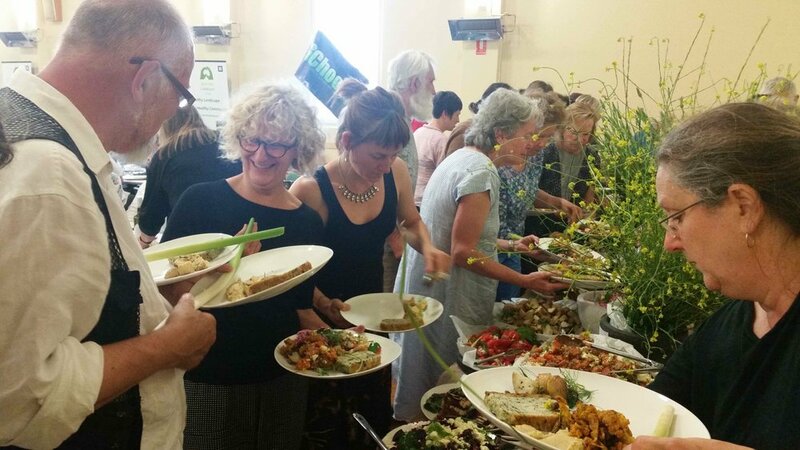 This workshop is for people in the Mudgee region interested in taking part in a pilot program that will harvest, package and deliver wild foods to Sydney chefs. The project has been devised by wild food expert Diego Bonetto after many years’ experience in the catering industry. Where: Near Mudgee, to be advised. Bring: lunch (some snacks and drinks will be provided). This workshop has been subsidised by the NSW Government via a grant from the Regional Partnerships scheme of Create NSW. It is part of the ‘An artist, a farmer and a scientist walk into a bar…’ project, visit ksca.land for details. Carbon is one of the most abundant elements in the Universe, and in our bodies. It gives us fire, diamonds, graphite and coal. Friend and foe, creator and destroyer, Carbon is a source of fertility in our landscapes and chaos in our climate. Join us for a fascinating workshop at The Living Classroom (TLC), with artists, farmers and scientists, to gain a fresh perspective on Carbon. Learn about biochar, a charcoal-based soil additive that has been used to re-purpose farm waste and build soil fertility for centuries. We will hear from those directly involved in the Biochar for Sustainable Soils (B4SS) project, active in China, Ethiopia, Kenya, Indonesia, Vietnam and Peru. Build a Kon-Tiki biochar kiln on site and produce a batch of biochar that you can take home with you. We will also test a charcoal drum kiln built by Peter Turnbull, who will describe his adaptation of a gasifier to convert chipped wood mass into electricity, hot water, gas and charcoal. Learn about the recently launched Carbon Farm, a world-first demonstration site at TLC showcasing carbon sequestration methods in farming and land management. Join a discussion and activities led by four artists in residence at TLC involved in the ‘An artist, a farmer and a scientist walk into a bar…’ project. We will explore how carbon features in the artists’ projects, and speculate on how carbon can be re-imagined in modern society. When: Sunday June 24 10:30am to 3:00pm. Tickets: $20, buy them through eventbrite here. Children are welcome! Bring: a light lunch – we will provide damper, soup, tea and coffee. Wear sensible clothing for outdoor work. Get in quick, places are limited!! Announcing the AFS Project launch dinner and theatre event! Sowing Stories: a workshop on communications and storytelling for ethically engaged creativity. Big Fag Press, Glebe, Sydney.